Claudia’s role goes above and beyond the normal, as shes prides herself on high levels of customer service. 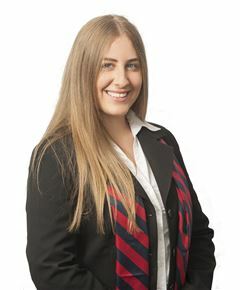 Claudia has excellent communication, problem solving, organizational, and time management skills enabling her to successfully liaise with all stakeholders to ensure that each listing and sale process goes as smoothly as possible. Since joining NAI Harcourts Realty Plus team, Claudia has made herself indispensable to all she assists: being efficient, dependable and resolved to continue learning. Claudia has worked in the customer service industry for almost five years. Her part time employment during High School years has set her above many of her peers and her personable and bubbly nature has been evident in the roles she has undertaken across the full week. Her “can do attitude” has been consistently evident since she has joined the team. Personable and friendly, she is passionate about providing outstanding customer service and thrives on seeing happy clients. She is dedicated to constantly updating and improving her skills. Outside of work she enjoys playing netball, soccer and indoor volleyball. She works 2 other part time jobs on the weekend to save for her current dream an around the world working holiday. Known for her dedication and passionate nature, Claudia prides herself on being a great person and a team player.